Well now I finally reached the end of the 15-painting rock/boulder challenge – took a bit more time than anticipated but I’m happy that I undertook it. The Range, (6×8) oil pastel was completed on cream tinted Mi-Teintes Pastel paper using mainly Senneliers, Neopastels and Mungyo-Gallery oil pastels. Tools included clay shapers and painting knives, many layers of paint was applied in this painting. I selected the mountain range called, Napes Needle, because I haven’t painted a mountain range before and thought the sharp dark edges of the mountain range against of a snowy mountain range would make for an interesting contrast and give the scene some depth. Thank you all for following along with this study – it was challenging, exasperating, exciting and thrilling. I think that 15 studies are a good amount to base on any particular subject. Hmmmmmm, wonder what the next will be . . .
Click onto image to see a full size. Reference image was from Gary Jones, a very talented photographer with pmp. 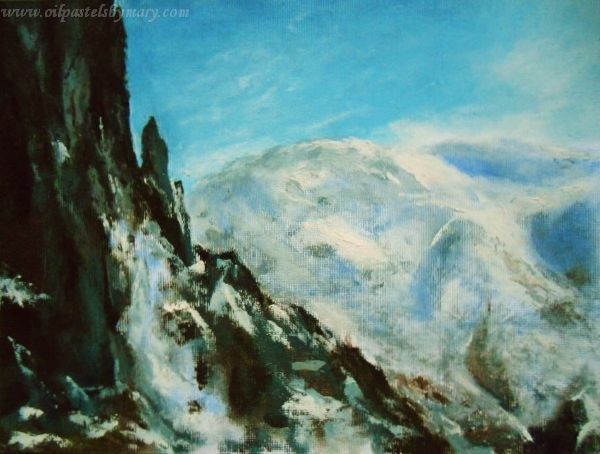 This entry was posted in Challenges: Subject Matter Studies, OPs New Paintings, Rocks/Boulders and tagged mountain, mountain range, oil pastels, painting, sky, snow. Bookmark the permalink. Hi Poppy! What a beautiful and generous comment, thank you so much. Got to say you’d never see me up there, my fear would be too gripping that I’d freeze w/no possibility of moving forward or backward. So very beautifully done! I know just how difficult it is to capture rocks, boulders and their surroundings, and you have conquered it! Great piece, Mary! Thanks Elena! This was an exciting piece to get into – less was more on the snow-filled mountain range and the textures were solid and thick on the open-faced range. Had a lot of fun working it. Thank you so much Emily, your comment means a lot. My husband is having a hard time letting go ~ no sales yet, perhaps one day. You need to sell one to me to break the ice ! Also, my friend who paints started posting paintings on Etsy and she’s made sales. Superb study Mary! I bet they look fantastic on the wall as a grouping! Along with everyone else here, I can’t wait to see what you do next. You are such a talented and creative artist. Hi Rhonda, thank you very much for generous comment and compliment ~ I really enjoyed this mountain study for the hard/soft edging and contrast in value range. Ops handle this type of scene really well. Well done, Mary! Looking forward to the next challenge! When I first looked at this one, my thought was, “This is the best of the best! I love it.” On second look, my reaction was the same. 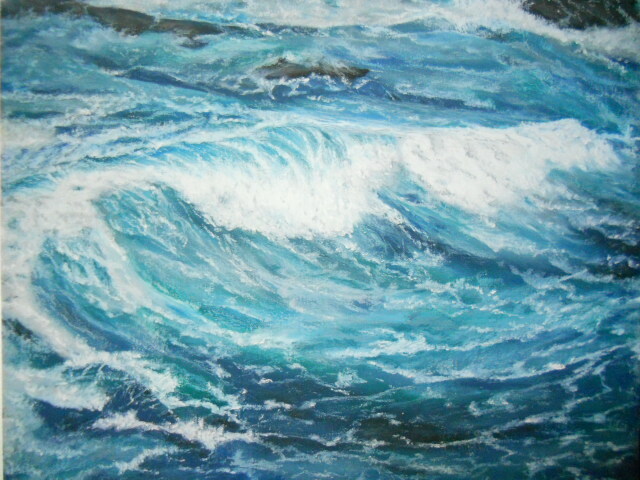 I saw it as a raging sea pounding against ragged rocky cliffs. Then I read your description and realized it’s two mountain ranges! I still think it’s the best of the best. And I love it. It’s beautiful either way but I can’t get the raging sea out of my mind. Dorann you just rock, what else can I say! I laughed and appreciated your beautiful comment and I can also see the raging sea (lol – the beauty of art, it can be whatever you want it to be). Glad you enjoyed the piece – thank you so much. Most impressive ending to the challenge indeed, there ain’t no mountain you cannot climb! Love your determination and how devoted you are to your art, it is very inspiring. Thank you for the wonderful journey, I’m looking forward to your next which I’m sure will be even more exciting! Congratulations! Another series completed with style. Thank you Gallivanta, really appreciate your enthusiasm and compliment. Enjoyed walking along with you on this challenge Mary. This one has a wonderfully wild and rugged feel about it. Thanks Don for your comments and tagging along. Rocks aren’t always that exciting to paint and there were some of these studies that really challenged my motivation, but glad that I stuck with it. Thank you M.R., you know I really appreciate you! Congratulations on your undertaking and completion of your rocks boulders challenge. You did a fantastic job! Thanks very much Carol, appreciate it! I’m going to miss your rock studies. This one especially shows the harshness of the conditions. I just got a quite good pic of rocks I was thinking to send you to do for your challenge. Guess I’m going to have to wait and see what comes next and take a new pic to contribute! Thanks very much A! for following along and your nice comment! It’s been a good ride for me. Hi Mary..I’m up here in Maine applauding…can you hear me? Thank you Cynthia – yes, I think I caught a few vibes down here in Texas! Thank you for all your encouragement and support Cynthia – you help me move the needle, that’s a big deal. Great job! Rocks are difficult to get right. Cannot wait to see what you do next Mary and Im sure it will be wonderful! Thanks so much Karen – I have lots of subjects running through my mind for the next series. I’ll have to settle on one pretty soon.